That’s her brother’s name. He’s the main character. Abate is apparently not one to follow convention. Why use the elevator when you can leap four stories onto a window sill? Capture from the Crunchyroll stream. The next scene used exposition to tell us that the Invertia happened and upset the world’s political balance of power. The Integrated Empire Foundation, made up of lots of businesses, took over. The Invertia also created the Genestella, people who have special combat skills. They will fight in entertainment battles called Festa. The story starts in Rikka, the Academy on the Water, which is commonly known as Asterisk. Hence the show’s title! Gotta say I’ve never been a fan of exposition. I prefer the information to be woven into the fabric of the story, so this was a turn off for me. Well, no anime is perfect. Our hero, Amagiri Ayato, is a Genestella, and we meet him as he finds a handkerchief that blew out an open window four stories above him. Most of us, when presented with such an opportunity, might be tempted to pick up the handkerchief, take the elevator, and knock on the door (guessing about which door based on the position of only open window). That’d give the occupant a chance to greet us normally. But Ayato? Nah. He uses his Genestalla powers and leaps onto the open window sill. Not surprisingly, he caught the occupant, Julis-Alexia van Riessfeld, dressing. This is anime, after all (though seriously, who pulls on their jumper before buttoning their shirt?). To her credit, she doesn’t freak out. She calmly tells him to turn around, finishes dressing, and asks him about the handkerchief. He tells her he found it, and she’s so overcome with relief that she tears up. Apparently, it’s “very, very dear to her.” I suspect Ayato thought he was safe she she thanked him. But no, she hadn’t forgotten that he saw her undressed, so she says she’s going to kill him and unleashes a huge fireball. Being the main character, he survives, and she challenges him to a duel. 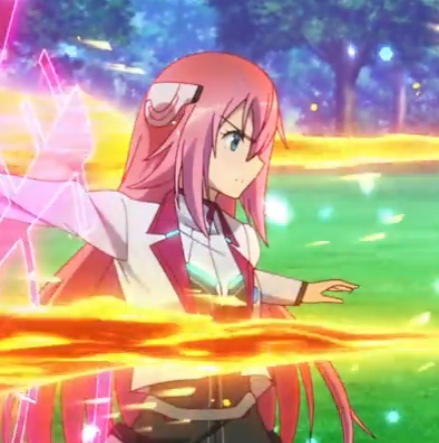 Julis seemed serious about her attack. Capture from Crunchyroll’s stream. The gathered crowd seemed pretty excited to see Julis, ranked number 5 at Asterisk, take on the newcomer. As you might expect from anime tropes, Ayato is much better than she expected. She can’t take him out even when she unleashes her most powerful attacks. He counters, but instead of winning the match, he knocks her down to save her from a dart of light that came from the crowd! From what I’ve seen so far (and I’ve seen the first four episodes), Asterisk employs this pattern: start with a trope before spinning it into something unexpected. At the end of the battle, I expected Ayato to win and force Julis to (grudgingly) respect him. Instead, the story introduced another plot point. Who launched the attack? Why? I really like a show that can do something unexpected yet stay within the confines of its universe. Of course, it wouldn’t be anime if it strayed too far from its form. When he knocked her down, his hand somehow ended up on her left breast. And of course, he couldn’t just let go. He had to squeeze. Fortunately for him, the chief representative of the Red Lotus (the same association Julis belongs to) and student council president, Claudia Enfield, intervened. Not only did she save his life, but she declared the match null and void because some “paperwork” held up Ayato officially being a student. Claudia pulls him away to finish his admittance. I give Claudia full points for honesty — I think! Capture from the Crunchyroll stream. I have to admire that kind of honesty. Claudia takes him to her office, where she explains how she expects him and all of the students to win in the yearly battles against the other five Genestella schools. This is apparently a problem for Asterisk, since their recent record is “dismal.” If he triumphs, Claudia tells him that he can have anything his heart desires. She reasonably asks him why he came to Asterisk, and he had a flashback of his sister and glowing chains — but not the same scene as started the episode. The chains appeared to envelop a younger Ayato. The memory prompted him to ask Claudia what she knew about his sister, which turned out to be not much. The records had apparently been destroyed. All the remained was a pixelated photo and the name of the sword she had used: Ogre Lux. Asterisk keeps all of its swords locked up, and there’s no record anyone used Ogre Lux. However, it has combat data from about the time Haruka would have been at the school. It piqued my interst when he said that he didn’t come to Asterisk to look for Haruka. Instead, he said he came to the school “…to search for what it is I’m supposed to do, I guess?” Claudia chooses to show her scheming side and tells him there really wasn’t any paperwork. She walks behind him, throws her arms around his chest, and says, “At long last… at long last, we meet.” She later said she was joking. Was she? Hard to say with Claudia. The embrace seemed awfully sincere! 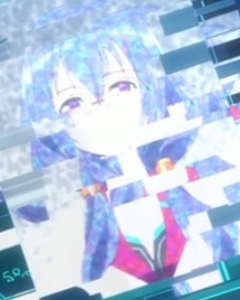 This was almost all that’s left of Haruka — just a pixelated image. Capture from Crunchyroll’s stream. No surprise when Ayato joins his class and finds his seat’s next to Julis. He tried to make up with her after class, but she shuts him down. Eishirou Yabuki, who was sitting behind Ayato and turns out to be his room mate, consoles him by saying that she keeps everyone at arm’s length. 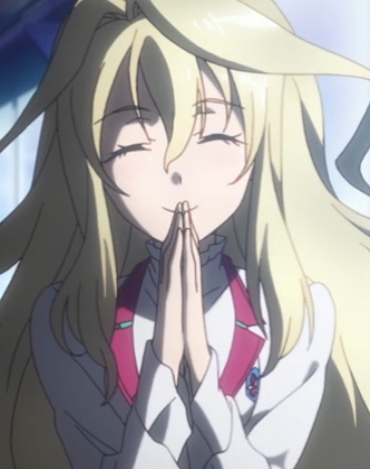 He also tells Ayato that Julis is a real princess of Lieseltania, a monarchy that’s rising in power in Europe. Not only is she a princess, but she’s the crown princess — and she’s a strega, which means witch, which is rare among the Genestella. Like everyone else, Eishirou wonders why she’s even bothering to attend Asterisk. Another interesting plot point! As they’re heading for the dorms, they come across Lester MacPhail, a very large and angry man, confronting Julis. Lester didn’t take kindly to her dueling Ayato when she repeatedly turned Lester down — though after beating him three times, I can see why she’d be bored with it. I have to admit that while I was watching Asterisk for the first time, up until this scene I was only mildly entertained. I mentioned some plot points that caught my interest, and the characters were likable enough, but despite its fun trope-tweaking, it didn’t really capture my imagination. Then this scene came up. As Lester pushes her to duel, he grabs her arm and says that he can’t accept defeat from a princess who’s just in it for fun. How cool is that? Of course I’m going to watch the rest of the series now! Caw Out Award: ​Most Heads-Up and Humane Attack of the Season!